When looking for the 5 best mattresses under $500, keep in mind that you will spend around a third of your life lying on it! Many people do not have an unlimited budget and have to be careful what they spend their money on. Most people believe that the higher the price, the more comfortable the mattress. That is not necessarily true. Another untruth is that you need an expensive mattress to keep you comfortable through the night. So – some questions! What’s more important – Price or Comfort? Comfort wins all the way! What’s more important – Price or Your Health? Your health wins all the way! If you are buying a TV, a laptop or a cell phone – or even a new cooker or car – what do you look for first? The price? Of course not! You look for what best suits you – and the price is just one of these variables that people consider when making a purchase. Our top 5 selection has been chosen for personal use, online reviews and manufacturers’ specifications. We will then offer you our Buyer’s Guide to Mattresses Under $500. This explains what factors you should be looking for and why. For now, here are our Top 5 best Mattresses Under 500 dollars for 2019. Note: We are reviewing the Queen size here. Sizes larger then the Queen will likely cost more. The Classic Brands Cool Gel Ultimate gel memory foam mattress is 14-inches thick. It is constructed with 2-inches of ventilated gel memory foam, 2-inches of regular memory foam, 2-inches of soft comfort foam and 8-inches of high-density support foam at the bottom. These constructions offer a cool and comfortable sleep with a solid base. The entire mattress is covered with a soft stretch knit fabric with side panels. The gel-infused memory foam not only offers excellent support, but the gel also keeps you cool at night. The entire structure supports your pressure points and is suitable for any way of sleeping: back, side or belly. Gel infused memory foam keeps you cool. Hard foam base gives excellent support so you don’t disappear into the mattress. CertiPUR-US foam – certified free of harmful emissions, ozone depleters and heavy metals. Comes with two free shredded memory foam pillows. Few: Some complaints about hardness and some of it being too soft. It just shows you cannot satisfy everybody. Editor’s Notes: This is an excellent mattress for its price tag. 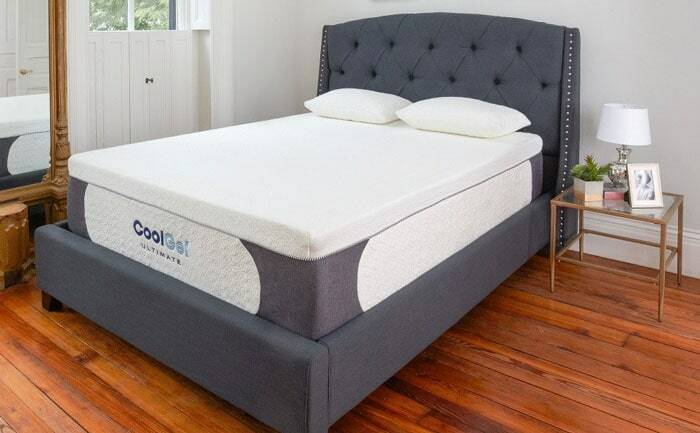 You shouldn’t have to sacrifice too much on quality when buying on price, and the Classic Brands cool gel memory foam mattress is a high-quality memory foam mattress. 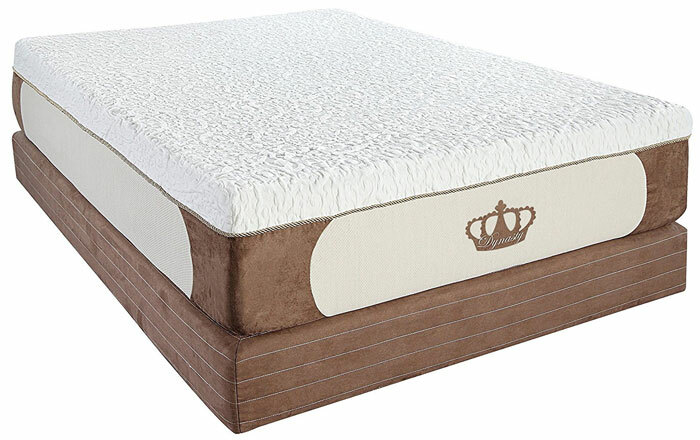 It’s not often that you will find a 14-inch thick Queen size mattress for under 500 USD. 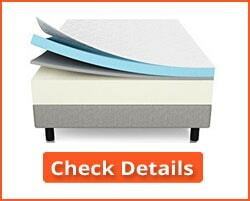 It is CertiPUR-US certified and is an excellent gel memory foam mattress. The LINENSPA 10-inch Latex Mattress is an ideal option for those who do not like memory foam mattresses. It is an excellent option for stomach and back sleepers, and side sleepers should also enjoy the support this mattress offers. The latex used is temperature-neutral, so will keep you cooler than most other foam mattresses. Many people do not like the ‘sink-in’ feeling of memory foam. This latex mattress does not do this: you feel as though you are lying on a soft yet supportive surface. 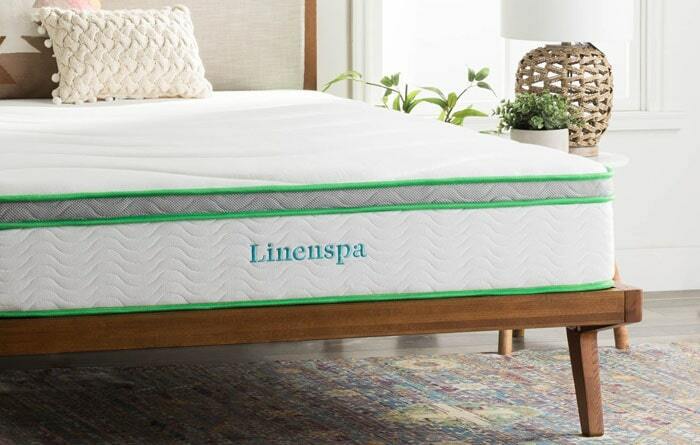 If you like the bounce of a traditional innerspring mattress, then the LINENSPA latex hybrid mattress is the option for you. It consists of a 7-inch base support of steel coils individually encased in foam. This provides a high level of isolation of motion between partners while also providing the ‘bounce’ that many partners like. The spring base is topped with a 1-inch quilted fast-response polyurethane foam over 2 inches of polyurethane foam and latex. This provides good responsive support for your individual body shape. Great for those who like a bouncy mattress. Suitable for all types of sleeper: front, back and side. Good separation of each partner’s movement while sleeping. Innerspring construction with 3-inch latex and foam top. 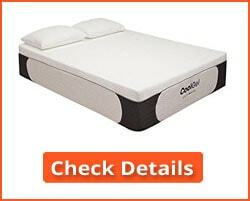 An excellent option for those that do not like the feel of memory foam. Good for any type of base including adjustable bases. 10-year manufacturer’s warranty against manufacturing defects. LINENSPA accept returns no questions asked up to 30 days after the purchase date on your receipt for a full refund. None that can be established. No users have made negative comments on the online sources we use. Editor’s Notes: This is the perfect mattress under 500 USD for those that prefer not to use a memory foam mattress. The construction is a hybrid between innerspring and a latex/polyurethane foam mattress. Although probably best for back or stomach sleepers, it is also suitable for side sleepers. Generally, however, side sleepers may prefer a memory foam mattress for pressure point support. The Signature Sleep Memoir 12-inch mattress comprises two layers: a top layer of 3.5-inch memory foam on top of 8.5-inches of high density support foam. The foam is CertiPUR-US certified for low VOC and is free of ozone depleters, heavy metals and toxic flame retardants. The memory foam supports your body evenly and prevents excess pressure on your pressure points: your hips, shoulders, knees, etc. As with most other memory foams, you get balanced support for your entire body. The 8.5-inches of high-density foam supports the weight of your body, with the memory foam offering comfort and pressure relief. Memory foam that takes pressure off your pressure points. Even, balanced support for your entire body. Soft cotton cover – but not removable. We advise you to purchase a separate mattress cover than can be removed for machine washing. Only a 1-year warranty compared to the 20+ years of those above. It’s not often that you find a good memory foam mattress under $500. 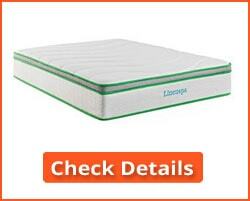 The DynastyMattress Cool Breeze mattress is a 12-inch thick gel memory foam mattress. It is constructed using 3 inches of gel memory foam on top, then two layers of 2-inch Air Cool Airflow Foam and finally a 5-inch support base of high-density foam. The gel in the memory foam absorbs heat to keep you cool when sleeping. The Air Cool Airflow foam also helps keep you cool at night by wicking away moisture and preventing heat buildup. This is a superb medium-firm memory foam mattress which provides excellent pressure relief for your pressure points while preventing you overheating during the night. Excellent 4-layer structure for the price. Needs a solid base, so likely unsuitable for slatted bases. Editor’s Note: This gel memory foam mattress is an excellent product for under $500. You may not find many 12-inch thick mattresses for that price. The combination of gel memory foam, cool Airflow foam and a hard base will suit most people. 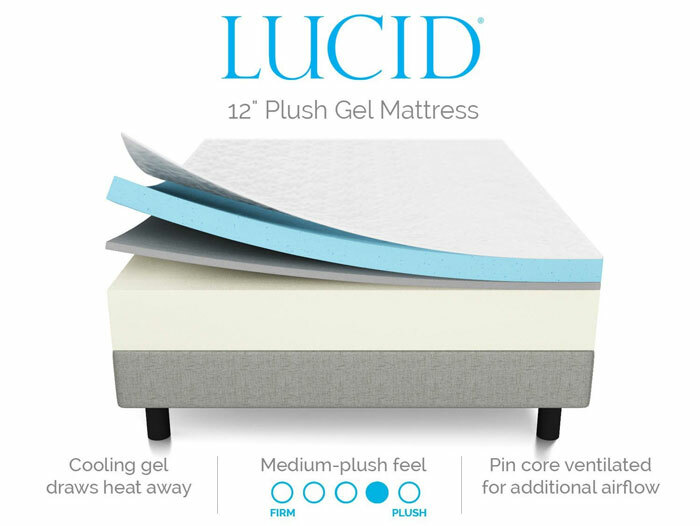 This Lucid gel memory foam mattress comprises a top 3-inch layer of 4-pound ventilated gel memory foam over a 1-inch bamboo charcoal memory foam support layer. Below this is an 8-inch support layer of high density foam. As with other gel memory foams, the top layer is infused with beads of gel that absorb body heat while you sleep. In addition to the gel beads, the foam has an open cell construction that promotes breathability and improves the memory aspect of the foam. The TENCEL Lycocell cover is designed to wick away moisture and provide a comfortable sleeping surface. 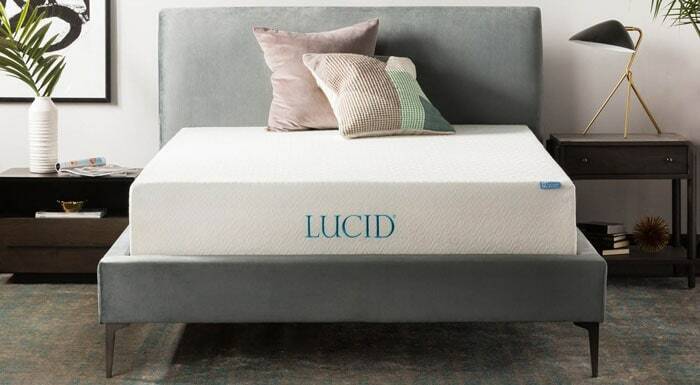 Like most other long-term warranties, the 25 years warranty that comes with this Lucid Mattress is valid only if the cover is unstained and there is no more than a 1.5” impression. 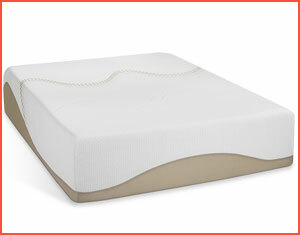 Gel memory foam supports the natural curvature of your spine while keeping you cool while sleeping. Medium-Plush top layer with a dense supportive base layer for good core support. It may be worth while using this with a separate cover or topper because the warranty is not valid if the mattress cover is stained. What mattress doesn’t get stained after a period of use? Otherwise an excellent mattress for the price. Editor’s Notes: Some users of this mattress have complained about it not expanding to the correct thickness. It is important to follow the manufacturer’s instructions after receiving delivery. Some compressed mattresses need 2-3 days to expand back to the correct size. Otherwise, this appears to be an excellent memory foam mattress with comfort, cooling and support for your pressure points: shoulders, hips and knees. This helps to maintain the correct curvature of your spine when sleeping and so assist in preventing neck and back pain. When buying a mattress under 500 USD in 2019 there is no reason to expect a poor, uncomfortable mattress. On the contrary, there are many extremely comfortable mattresses under 500 USD that include space-age memory foam for pressure point relief, or a spring base for bounciness and night games. Our selection above includes the five mattresses under 500 USD that we consider the best value for money. What should you be looking for in a mattress within this price cap? Comfort, certainly – why purchase an uncomfortable mattress just to keep the price down? There is no need to, and each of our five choices provides maximum comfort at a minimal price. 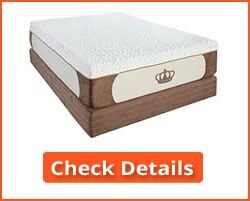 Here is a guide on how to purchase the best mattress for your needs at below 500 USD. They will certainly surprise those that believe they have to spend over $1,000 for a good mattress. Sleep is important to good health, particularly restful sleep. If you wake up feeling tired or with an ache in your back, neck or shoulders, then your mattress is likely the cause. You may be sleeping either on the wrong mattress or in the wrong position. Your spine has a natural curve in the shape of the letter S. It bends round inwards from your neck, then outwards to your hips. Your lower back, the lower curve of the S, needs support when you are sleeping. A memory foam mattress conforms to the natural shape of your body, supporting your spine in its natural position. If you sleep on your side, this may not be so important, although memory foam will relieve pressure on your shoulder and hip while you sleep. While memory foam may be the ideal solution for back pain, and for pressure pain in your shoulder and hips, many people do not like it. They feel it makes them too hot (gel-infused memory foam may help here) and perhaps too enclosed in their mattress. In such cases, a latex/polyurethane foam may help. 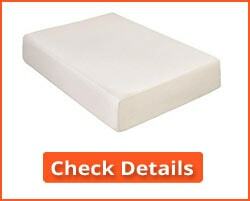 Memory foam is made from polyurethane, but you can also get PU foam that is not memory foam. 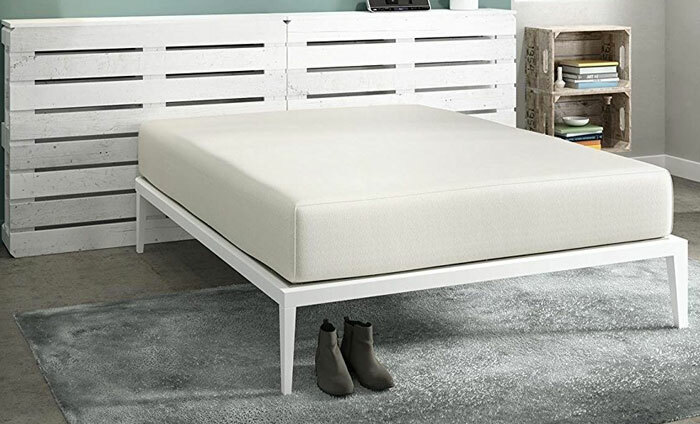 For that reason, we have included an option that is not memory foam but of a more traditional innerspring construction that is itself encased in foam and has a latex foam top for maximum comfort. So what should you be looking for? What are your main priorities when buying a mattress under 500 USD? Many young couples prefer an innerspring mattress because of the bounce it gives them during adult nigh-time activities. Memory foam tends to hold you back a bit. In this case, our second choice above may be best for you: the 10-inch latex topped mattress with individual steel spring coils. This mattress offers excellent bounce plus good separation of the movement of each partner while sleeping. If you suffer from back pain, have you tried a memory foam mattress? If not, then go for that because it has helped many people with pain in the lower back. The same applies to neck pain. A memory foam mattress can support your entire spine in the correct position while you sleep. It is particularly good for back sleepers and side sleepers. If you sleep on your stomach, you may find memory foam more comfortable than latex, but not always. Whichever choice you make, check the guarantees, warranties and returns policy. You may be able to return the mattress with no questions asked within a certain period of time. Certain sellers, such as Amazon, offer a trial period during which you can return your mattress for a full refund if you don’t like it. Many warranties apply only if the mattress cover provided is unstained. In order to avoid this issue, it is advisable to purchase a mattress cover or pad to protect the outer cover of the mattress as supplied. Most do not have zippered covers. Any spillage or stain on the cover can invalidate your warranty. It is also advisable that, if your cover does get marked or stained, to remove it with a spot cleaner. Here are some FAQs we have had to answer in respect of our review of the best mattresses under 500 USD. 1. Why are there not more innerspring and ordinary latex foam mattresses in your selection? Because we are reviewing just our top 5! In our opinion, the less expensive memory foam mattresses are generally better to sleep on than the lower-priced latex foam or innerspring mattresses. We have included one innerspring and latex foam mattress because of it of high quality for its price. The less expensive innerspring mattresses are usually not good for back pain and don’t offer the same type of natural support for your body contours as memory foam does. 2. Why is Gel memory Foam Better than Ordinary Memory Foam? Gel memory foam is infused with tiny gel beads that open up the structure of the foam. The more open structure enables heat to escape quicker. Also, the gel inside the beads absorbs heat from the mattress. So, as your body heat makes the temperature of the mattress surface rise, not only do the gel beads absorb some of that heat but it also dissipates quicker through the more open foam structure. Yes, you feel cooler as you are going to sleep, which is good, and yes, you may feel warmer if you wake up in the night because the gel has attained the temperature of the rest of the mattress. 3. You Don’t Mention the Density or ILD of the mattresses you tested – why not? Mainly because many manufacturers no longer publish much of this data. ILD, Density and Hardness are no longer published as they once were. This may largely be due to the number of different types of foam available today, where these measurements are not longer as comparative between types of foam as they were (e/g/ latex vs. memory foam vs. gel memory foam, etc). We could contact manufacturers, but many businesses do not manufacture the mattresses they market. It would not be a fair comparison to publish some manufacturers’ data but not all. 4. What’s the difference between a warranty and a returns policy? I sometimes see both on some sites. Warranty: A manufacturer’s warrant will usually cover you for manufacturing defects only. Some warranties can last for 25 to 30 years or more, but they only cover defects due to manufacturing faults. Many aspects of the use of a mattress can invalidate the warranty, including actually using it! Any stain on the cover of the mattress will invalidate most warranties as will any indentations of more than a stated depth. That is one reason why we recommend you to use a mattress cover or pad that fits over the mattress – that will collect any staining and help keep your warranty valid. Returns Policy: Many sellers will offer a returns policy. In most cases, you can return the product in pristine condition with a certain period of time: 7 days, 14 days or even 30 days in some cases. Again, any evidence of use may invalidate this. Sometimes the platform used by the seller will offer its own guarantee. eBay and Amazon, for example, have their own policies – in some cases, you get a period of time to use the product before returning it. Check with the manufacturer, seller and sales platform for more information. 5. How do you grade your recommended products from 1-5 and how do you establish your rating of 0-5? The grading is carried out according to our rating: the highest rated mattress comes in at #1 and the lowest at #5. Keep in mind this is just our top 5 of perhaps dozens reviewed. We could give you a choice of 10, but we find that 5 is best for most people to choose from. Regarding our Rating: This is based upon general comments online regarding each product, online reviews, product specifications, manufacturer’s and seller’s websites, response to questions we have asked regarding the product and even personal use in some cases. As explained above, our selection of best mattresses under $500 is based on personal experience, reviewable data and on a careful examination of marketers’ and manufacturers’ websites. A mattress is a very personal thing, and what one person feels to be very comfortable may not be so to another. The best mattresses under $500 are not necessarily any less comfortable to sleep on than those much more expensive. Our top 5 meet this criterion: they are comfortable and offer the type of support needed to keep your spine in good shape. They offer a good range of selection for back, front and side sleepers as well as those preferring bounciness to enveloping comfort.